This treat needs raw peanuts, not roasted, and a candy thermometer. 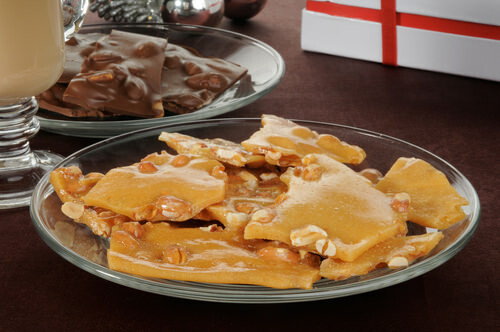 Generally, it’s very easy to find raw peanuts during Christmas time, because peanut brittle is an ordinary treat to cook for the holiday. For my dad this treat is difficult to make but, to tell the truth, the candy takes patience and is easy to make. It’s important to be attentive on the sugar mixture so it doesn’t burn and then you should wait when the brittle gets hard enough to break into pieces.